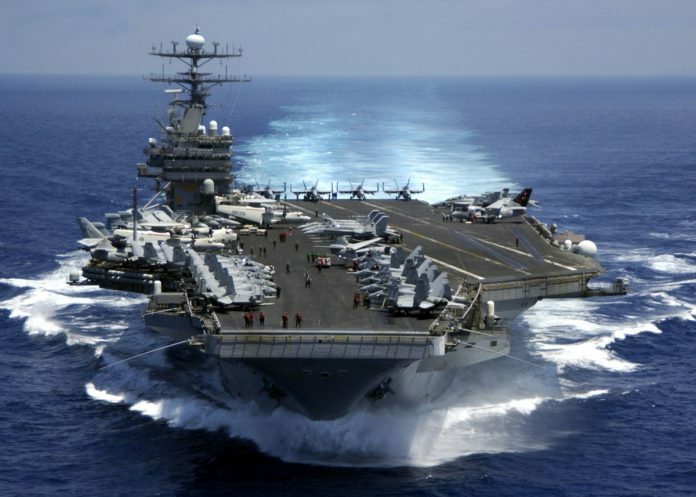 The Pentagon says a Navy carrier strike group is moving toward the western Pacific Ocean to provide a physical presence near the Korean Peninsula. President Trump has said the US is prepared to act alone to deal with the nuclear threat from North Korea. The US military has ordered a navy strike group to move towards the Korean peninsula, amid growing concerns about North Korea’s missile programe. “The number one threat in the region continues to be North Korea, due to its reckless, irresponsible and destabilizing programe of missile tests and pursuit of a nuclear weapons capability,” US Pacific Command spokesman Dave Benham said. It was originally due to make port calls in Australia but instead has been diverted from Singapore to the west Pacific. China has however been reluctant to isolate its neighbor, fearing its collapse could spawn a refugee crisis and bring the US military to its doorstep. US deploys navy strike group to Korean peninsula. The Carl Vinson Strike Group comprises an aircraft carrier and other warships.